Johor Bahru, the capital city of the Malaysia’s southernmost state, Johor offers a plethora of interesting attractions like Legoland Malaysia, Sanrio Hello Kitty Town, the Johor Zoo, Johor Premium Outlets, Danga Bay and so forth. Amongst the city’s many diverse attractions is the imposing sight of the Sultan Abu Baker State Mosque. Perched atop a hill in downtown Johor Bahru, this impressive edifice offers jaw-dropping views of the city, the straits of Johor and neighboring Singapore. The mosque, which is located on Jalan Skudai, close to another prominent attraction of Johor Bahru, the Royal Abu Bakar Museum, dates back to the late 19th century, when Sultan Abu Bakar was the ruler of Johor. The Sultan was an enlightened leader who is credited with overhauling many of Johor’s integral services like infrastructure, the administrative system, the military and civil service. He reorganized these services on western lines and it is for this reason that he is often referred to as the ‘Father of Modern Johor’. The Sultan commissioned the construction of the mosque in 1892 and appointed Tuan Haji Mohamed Arif bin Punak as its chief architect. Tuan Haji Mohamed Arif bin Punak was supervised by Johor government engineer Dato' Yahya bin Awalluddin who infact appraised him of the Sultan’s love and admiration for English architecture. As a result, Tuan Haji Mohamed Arif bin Punak designed a mosque that displayed a mixture of Victorian, Moorish and even Malay design elements. The Victorian design influences of the mosque are immediately evident on viewing its minarets for they are quite similar to British 19th century clock towers. The Sultan Abu Baker mosque has the capacity to accommodate 2000 worshippers at a time. The mosque also admits non-Muslims, though they are expected to be respectful, dress modestly and remove their shoes while visiting the mosque. 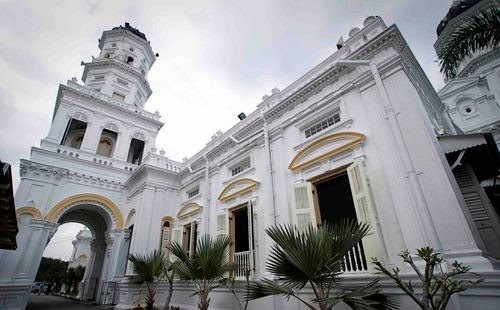 The Sultan Abu Baker is today is designated as a protected heritage monument by the Malaysian Department of Museums and Antiquities, which is also responsible for its upkeep and preservation. 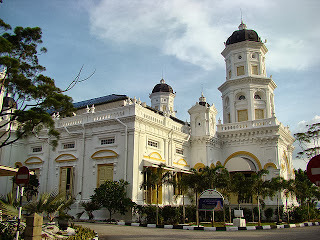 The Sultan Abu Baker mosque is a highly recommended attraction which needs to be included on visit Johor Bahru itinerary.